Since 2006, Old St. Paul’s has prided itself on having a thriving youth group for teens, but it wasn’t until this previous Sunday that it celebrated its first official Youth Sunday. Youth Sundays can vary widely from church to church, including everything from special announcements regarding youth group activities and achievements to youth-led sermons. At Old St. Paul’s, Youth Sunday came in the wake of our Youth Confirmation Retreat, led by Youth Minister, Jessica Sexton and vestry member, Georgina Anton. Through the advent of our Youth Sunday, Jessica sought to inspire our youth to consider how they might use their spiritual gifts in service to the church, encouraging them to take on new roles and responsibilities both in and out of the worship service. This means that, with the exception of the choir, our youth group took on allnon-ordained roles in the Youth Sunday worship service: acolytes, chalicists, hosts/ushers, readers, and Prayers for the People. For though our church recognizes no specific rules regarding age for these positions, these roles tend to most often go to adult members of the congregation (save for the role of acolyte). Each position in the worship service inevitably holds greater and greater meaning the more involved, mature, and educated a person becomes on each element and how they all fit together on Sunday morning. This Sunday, our sanctuary was refreshed by a host of new voices, reminding us that wisdom can come from any thoughtful, reasoning person—no matter their age, background, or any other difference that’d seek to divide us. In the morning’s Forum, The Rev. Mary Luck Stanley led us in a discussion on Social Teachings and the Church, touching on everything from the Church’s role in taking moral stands on matters of social justice to issues of the Church’s continued relevancy in today’s world. And while our discussion was spirited, diverse, and thoughtful, I found myself grinning about parts of it during the worship service. What’s the Church’s continued relevancy today? —A strange question in a community where youth members—many of them not yet confirmed in the Church; many of them still on the fence about whether or not being confirmed is even what they want—would come together to help lead us in a worship service, would acknowledge us as a community worth investing in, worth working for, worth seeking wisdom from and imparting wisdom to. Our relevancy, the Church’s relevancy, as Mary went on to explain, isn’t founded in what moral or social issues it stakes itself to, but in its members, young and old, and in helping guide and support those members on their way to discerning the capital-T Truth together. 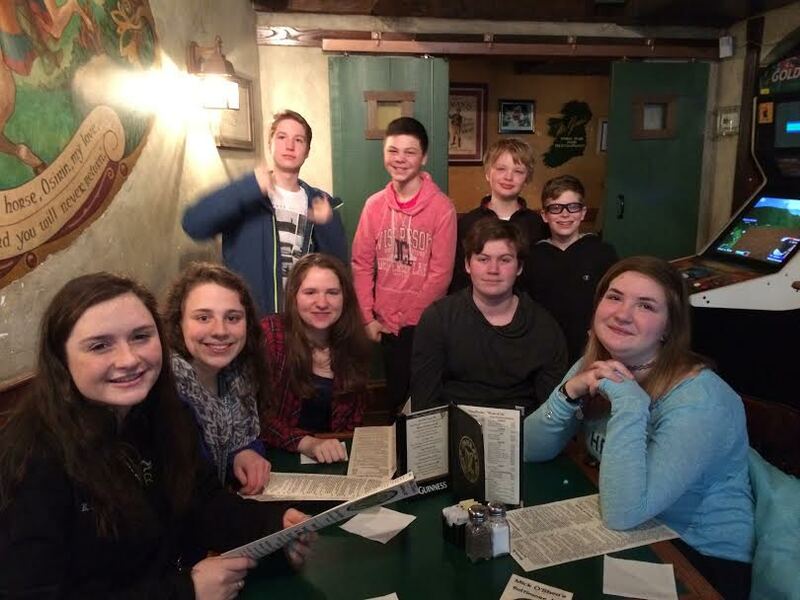 Thank you to all our youth members: Jack Stanley, Hannah Stanley, Sophie Allen, Andrew Bickford, David Giordano, Kenny Gaisor, Nathan LaClair, Elizabeth Greisman, and Erin Barringer, who served this past Sunday! And a very special thank you to Jessica Sexton and Georgina Anton—without you, none of this would’ve been possible. By livingourfaithosp in Faith Journeys, Old St. Paul's Highlights on March 11, 2015 . The youth did a truly wonderful job. Hopefully this was the first of what will become at least an annual tradition–more often if the youth are so inclined. Keep up the good work! among the span of ages.